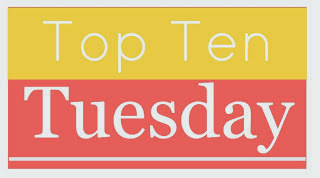 This week is pretty open-ended (top ten books for readers who like X)! We chose to talk about series with more than 3 books! We love duologies and trilogies. WE DO. But we also really love getting caught up in a story that spans more than 3 books. So if you are looking for a longer series, we've got you covered! 1. Throne of Glass series by Sarah J. Maas: This one is a planned series of 6 and book four will be out this Fall! I LOVE this series so much. Like all time favorite series status thus far. 2. The Jessica Darling series by Megan McCafferty: I LOVED this series so much. Getting to watch Jessica grow from a high school student to a young adult was the BEST. If you love contemporary and are looking for a series, this one is AWESOME and so, so funny! 3. The Body Finder series by Kimberly Derting: This one is 4 books so not SUPER long but still a good size. If you like ghosty/supernatural stuff, check this one out. The main character can hear the echos of the dead who have been murdered and she begins to help solve their crimes. 4. The Lunar Chronicles by Marissa Meyer: LOVE this series so much. Kickass sci-fi fairytale retellings! 5. The Raven Cycle by Maggie Stiefvater: I haven't finished all the books that are currently out but OMG THIS SERIES. It's brilliant and unlike anything I've ever read plus the characters are AMAAAZING. 4. The Bone Season series by Samantha Shannon: this one is planned to be a 7 book series, so this will last me a while! I really loved the first two books in this series that are out so far! Don't feel daunted by their size, it's awesome. 6. The Percy Jackson and the Olympians series and The Heroes of Olympus series by Rick Riordan: I LOVE the Percy Jackson books and while I still haven't started the Heroes of Olympus series yet, I hear it's AMAZING and also, both series are 5 books, so you can feast yourself on 10 books in total! WIN! 7. The Harry Potter series by J.K. Rowling: Yeah, I couldn't resist. So this is 7 books and if you haven't read this you should. If you have, you should re-read it. I'm itching to! 8. The Pretty Little Liars series by Sara Shepard: I've only read the first book, but there are what, like 16 books now? I hear from the boyfriend's sister, who's read them all, that you can read the first 8 and have an answer to who the heck A is, so I'm probably gonna ignore the books after that one. Sorry about that!! SO WEIRD. No idea what happened to it. It worked last night when I previewed it. Freaking Blogger!! Jamie and Daisy, I love that you chose ToG and Lunar Chronicles (Me too!). I Daisy, I love all of your choices! Great job, ladies! I love that you chose books with more than 3 in a series! Kat and I also featured series, albeit in different ways! Throne of Glass, The Lunar Chronicles and The Bone Season are all brilliant and I can't wait to read the next books in those series! Harry Potter was pretty much a given! I loved Morganville Vampires. So I stopped watching the PPL show, because I was getting annoyed about not knowing who A is, I feel with that show the audience should know more than the characters, and I'd really like to know who A is. I know!! I really need to know who A is, so I'm sticking with it to find out... I need closure.. I did Historical YA w/a Paranormal Twist. Had fun coming up with books that qualified! Harry Potter is an all time favorite of mine. The Lunar Chronicles is way more amazing that I ever expected. Also, Raven Cycle is a mst read. I like longer series too, just not too long. I still haven't read the last House of Night book. Harry Potter is just a must. It's probably one of my favorite series ever. I REALLY have to read the Throne of Glass series! And Harry Potter. Of course. Yes. Ah yesss to Throne of Glass, Lunar Chronicles, and The Raven Cycle! Such amazing series! I discussed my Top Ten Books for Readers Who Like Atmospheric Settings. Books featured included The Night Circus, A Darker Shade of Magic, Daughter of Smoke & Bone, and more. No linky this week? Great list guys. Blogger ate it or something! NO IDEA haha. It's up now!! You've really listed some of my favorite series! Like A Song of Ice and Fire, The Lunar Chronicles & The Raven Cycle. So glad you've told me about the Bone Season series - I thought it was a trilogy so was waiting for the third before starting! I read a couple of book in the Body Finder series and then stopped. I need to re-read it. And Harry Potter and Percy Jackson - absolutely. Such a nice list of great series!! Harry Potter and the Raven Cycle are both two of my favorites! I'll admit it. With series longer than three books I prefer to wait til all the books are out to read them. Love Harry Potter and the Lunar Chronicles. I didn't realize that Throne of Glass was planned to be that many books until I finished book 3 very frustrated. Loved those books but I'll wait til the rest of the books are out to finish the series. I really need to reed Throne of Glass and Raven Cycle. I've heard such great things about them. I read the Pretty Little Liars series and I really enjoyed the who killed Ali and who is 'A' mysteries. But book 9 went into a new secret and the girls seemed to turn into utter morons and I quit after book 9. I love a good long lasting series but hate a series that drags on long after the author should have wrapped it up. Yeah, I heard that they extended it after the original 8 books and I'm just not going to bother with those. But I really need to continue that series! I've only read the first book. I love series and your picks made my day :D Throne of Glass, Lunar Chronicles, Raven Boys, Harry Potter and Percy Jackson! ALL AWESOME. Series are so good, but so hard to wait for, sigh. You've hit on some of my favorites too Raven Boys, Harry Potter, Percy Jackson, wonderful books! Harry Potter, The Lunar Chronicles, Pretty Little Liars, and the Throne of Glass series are all amazing! I'll have to check the others out! Great topic this week, and I love your list. You mentioned some really good series. Great picks there is a few series on your list I want to check out. The Bone Season and Throne of glass series. Wasn't today's topic about Books for Readers who Like _______? Yeah....up to you to choose. So we chose books for readers who like.....series with more than 3 books in them! If you're going to read both the Percy Jackson series by Rick Riordan, you might as well also read the Kane Chronicles... and the two short-stories of cross-over. Because I have a sneaking suspicion that the worlds are going to collide... and by "suspicion" I mean "hope"
Yup, I have those sitting on my shelf as well ;) Rick Riordan's writing is basically just awesome. ToG, The Lunar Chronices + the Raven Cycle are fabulous! And adore the Percy Jackson books (they're so fun)! And of course, Harry Potter is amazing! Throne of Glass, Body Finder & Harry Potter <3 Great lists! Great list, but I need to add the Gone series. If you haven't read it yet, please do. It is AMAZING!! I can count the number of series with 3+ books I've completed on one hand... and most of them didn't end up being favourites. (Twilight... bleh.) I liked Philip Pullman's Sally Lockhart series (there are three books, I think, but there's also a companion novel with some of the same characters, so I think that counts). I also enjoyed Beverly Cleary's Ramona books when I was a kid. So many great series here! I loved Percy Jackson and Gone by Michael Grant would be on my list as well as Noughts and Crosses by Malorie Blackman. I have yet to try a lot of these, but I will be getting round to it. Oh, and I am currently reading Cinder for the first time right now! Great list! I love Harry Potter, Percy Jackson, and The Song of Ice and Fire. I love all of these picks, but I'd also add the Sisterhood of the Traveling Pants series and the Princess Diaries series, just because I read both of those so much in high school and LOVED them. Great picks ladies! So many of these are on my TBR, I have Throne of Glass and Cinder just waiting for me!! I need to get on that ASAP! !